The popular drama "Emperor of the Sea" is getting rave reviews in the overseas market. The KBS 2TV drama is up for an Emmy, the prestigious U.S. TV award, and recently, at the major international TV market MIPTV, it received concentrated attention from the entire world. MIPTV is an international TV program market that opens every April in Cannes, France. This year's festival, convened from Monday to Friday at the Palais des Festivals -- the same venue as the Cannes International Film Festival -- and attended by about 10,000 broadcast officials from about 100 countries worldwide, was a smashing success. According to a KBS official who attended the event, there was an endless line of officials from overseas broadcast companies leading to the KBS booth. From the opening day of the festival, officials were flooding in, and not just from "Korean Wave" markets like Japan and China, but also from markets where Korean dramas have yet to penetrate deeply, like Europe and the United States. 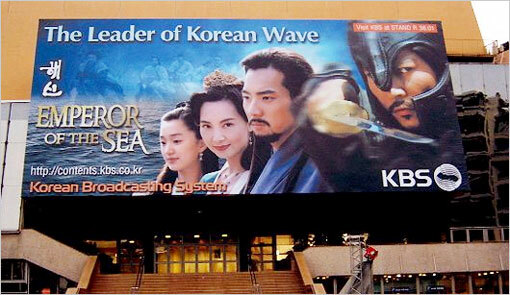 The 25-meter-long, 12-meter-wide "Emperor of the Sea" banner hanging outside the Palais des Festivals also drew the attention of visitors. A former Universal Studios marketing manager said, "U.S. and European broadcasters are busy with reality programs, which can be made on the cheap and draw many viewers, and sitcoms. They cannot even picture doing movie-quality dramas like 'Emperor of the Sea'... The market competitiveness and chances for success for 'Emperor of the Sea' are highly evaluated." Meanwhile, perhaps reflecting this interest, 17 journalists with the Seoul Foreign Press Club from 13 media outlets like Reuters, CNN and the Asahi Shimbun visited the KBS drama set in Suwon, where "Emperor of the Sea" is filmed. Their fierce coverage war once again reaffirmed the popularity of the drama.